Healthcare organizations are subject to strict compliance regulations that include effective management of privileged access to applications and systems and yet these organizations are under constant budget pressure. 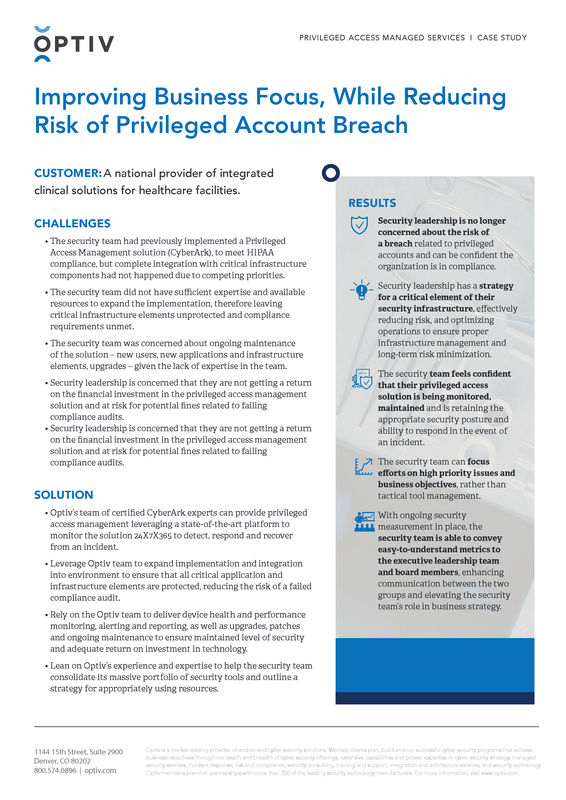 Find out how an Optiv customer leveraged our Privileged Access Managed Services to ensure complete protection of their most vulnerable identities, while enabling resources to focus on higher priority issues and business objectives. Build a disciplined IAM solution to securely enable the right individuals to access the right resources at the right times for the right reasons. Not sure how to get the most out of your IAM program? Our workshops and assessments help align your IAM strategy with the needs of your business.